Lovecraft's Untold Stories is an action rogue-lite with RPG elements. You explore randomly generated levels based in H.P. Lovecraft stories, fighting cultists and all kinds of monsters from the Mythos, improving your weapons and gear, solving puzzles and challenges, and looking for clues and knowledge to defeat the Great Old Ones and the Outer Gods. 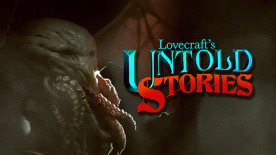 Lovecraft's Untold Stories is based on H.P. Lovecraft's stories. You will experience first-hand the cosmic horror created by the genius of Providence. Every character will go through an investigation that will take them through different locations, from the creepy old Victorian mansion to the abandoned hospital where forbidden experiments take place or the jungle where lost tribes celebrate forgotten rituals, just to name a few. Levels are randomly generated: it will be a different experience every time you play. Also, they vary depending on the character you're playing with. Look for items and clues to unlock secrets and new stories! You can play as 5 different characters, each with a different playstyle and storyline. A private detective, a witch, a thief, a professor, and even a ghoul—each with different stats, weapons, and combat moves, creating five entirely different gameplay experiences. The Detective offers a balanced playstyle, with average Health and Stamina. The Professor is a specialist in ranged combat, with less Health and a special shield granted by his weapon, the Tillinghast. The Witch does a lot of damage, has teleport abilities and elemental shields of fire and ice, but also a very low Health. The Thief is a specialist in melée combat that takes advantage of its stealth to maximize her damage. The ghoul does a lot of melée damage, has a high Health and regenerates itself, but can't use medkits at all. The truth of the dark horrors that inhabit the universe is unbearable for any human mind. In the end, you can't win against the Old Ones. Madness or death await you. But maybe you can delay the inevitable... If you face the Great Old Ones without any knowledge about them, you will go mad just by looking at their hideous features. But spread across every level you will find special items with information about the Great Old Ones. The more you know about them, the stronger your mind shall become - but knowledge is not easy to find, and if you are not thorough in your investigation you might get to the end of a storyline without finding everything that is to know. You will have to play with all the characters if you want to find all the information about every Great Old One! Collect and improve weapons, items, and artifacts. Each character has a set of weapons and items, and there are hundreds of other items you can find and use! © 2019 by LLC Blini Games, Balkanskiy 3 (Astra), office 2. Saint Petersburg, Russia. Lovecraft's Untold Stories, LLC Blini Games and their respective logos are trademarks of LLC Blini Games. All other trademarks, logos and copyrights are property of their respective owners. All rights reserved.